The “Welcome to Pride” guide was created as part of the Welcome to Pride Initiative, which seeks to ensure that the LGBT pioneers who laid the groundwork for today’s Pride marches and parades are welcomed and celebrated. 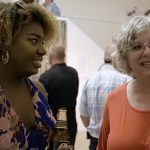 Together with our partners at CenterLink, the Center for Black Equity, Heritage of Pride and InterPride—and with generous support from AARP—we have sought to identify and implement age-friendly practices, systematically eliminating barriers and working to increase the visibility and participation of our LGBT elders. For the last 50 years, the LGBT community has come together for Pride parades, marches and festivals where we celebrate, protest and connect. But for our LGBT elders, it can seem as if the parade has passed them by. 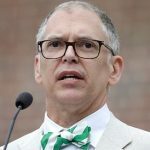 The crowds, the heat, and the lack of seating, shade and access to bathrooms are the more obvious barriers to active participation of LGBT older adults, but less obvious barriers also exist. If LGBT elders are not included in the planning process, if they are not represented in promotional materials, if they are not proudly marching and riding on floats, this lack of inclusion and visibility sends the message that they are not welcome. The goals of the Welcome to Pride Initiative are: to learn about effective age-friendly features that Pride organizers and elder advocates currently have in place; to share these best practices; and to secure commitments from Pride organizers to maintain or increase the number of age-friendly features of their events. Checklist of Essential Features of an Age-Friendly Pride—both an instructive tool with a clear framework and lots of practical ideas, and a measurement to help organizations and coalitions chart their progress as they increase the numbers of features they have in place. The Age-Friendly Pride Pledge—for organizations wishing to publicly commit to implementing or maintaining at least three age-friendly practices. Results of Two Nationwide Surveys—the collective wisdom from these surveys are the basis of the Checklist of Essential Features. Links to LGBT Aging and Age-friendly Resources for organizations and individuals wanting to take a deeper dive. Advocacy Templates—customizable letter templates for organizers and individuals. 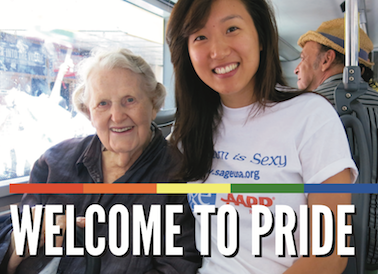 We encourage all who are interested in creating a welcoming environment for LGBT older adults—our community’s pioneers—to download the guide now, and to sign the Age-Friendly Pride Pledge.